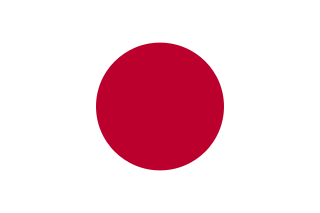 The national flag of Japan is a rectangular white banner bearing a crimson-red disc at its center. This flag is officially called Nisshōki , but is more commonly known in Japan as Hinomaru . It embodies the country's sobriquet: Land of the Rising Sun. Yoshitaka Sakurada is a Japanese politician of the Liberal Democratic Party, and a member of the House of Representatives in the Diet. He formerly served as Minister of State for the Tokyo Olympic and Paralympic Games in the Fourth Abe Cabinet. He is a pro-Brexit member of the parliament.